KoopaTV: MADDEN CURSE: THE MOVIE! By LUDWIG VON KOOPA - Cursed to deal with EA's PR. Back in December of 2010, buzz went around the Internet that EA Entertainment was releasing a Madden Curse movie directed by Pat O'Brien. Since then, we've had no idea what happened to the movie. (For more information about the Madden Curse, look it up yourself.) Being a paragon of exemplary journalism to answer the questions that we need to know, KoopaTV went through the mud to dredge up the latest information on this forgotten production. ...What happened after is extraordinary. Durgesh: Thanks for contacting EA Customer Experience, my name is Durgesh. How may I assist you today? KoopaTV: Hi, I'd like to know what happened to the Madden Curse movie announced back in December of 2010. Durgesh: I sincerely apologize but our developers have not update information about this at the moment. KoopaTV: Yeah, it was announced then to be directed by Pat O'Brien and nothing has been heard since. KoopaTV: Which specific person do you think would know? KoopaTV: When do you think we would get an answer by? KoopaTV: Okay, thank you very much Durgesh. We later learned that Durgesh's last name begins with the letter "S". So, we had another point of contact to make, so we ventured on! An Origin Help Centre representative told me to contact you because I wished to know the status of the Madden Curse movie announced back in December of 2010. The announcement claimed that Mr. Pat O'Brien of EA Entertainment was one of the producers of this movie, yet there has been no news of the movie since December 2010. Did it get canceled? Was it a joke? Is it still happening? Is there a release date? After waiting a week (which is more than anyone's interpretation of what "within few days" means), she never replied. So I sent the exact same e-mail to Wendy Spander on Memorial Day Monday (including the part where Durgesh said for me to contact her, which in this case isn't true). I will be out of the office today with no access to email or voiceail. Our office will be closed on Monday for Memorial Day. I don't know what "voiceail" is, but KoopaTV decided not to contact Greg Gervin for now. The reason for this is that Friday is AFTER Tuesday — Therefore, going the "urgent" route would make my wait for an answer LONGER. Unfortunately, Tuesday passed us and Ms. Spander seems to have fallen to the same illness that Ms. Brett has. Running out of options in our search for the truth, KoopaTV sent an e-mail to Greg Gervin, who is NOT listed in that PR Contact list on EA's website. Hopefully that means he's quarantined from the plague inside EA. Ms. Spander of EA Corporate Communications hasn't replied to the inquiry I sent her in a timely manner (as defined by herself), and Ms. Brett of EA SPORTS: Madden division may have very well passed away because it has now been over a week since I asked her the same inquiry I sent Ms. Spander without so much as a reply. Ms. Spander left me your e-mail address to try in case she couldn't reply. I'm investigating the status of the Madden Curse movie announced back in December of 2010, supposedly directed by EA Entertainment VP Pat O'Brien. There has been no word on the status of the movie since, and the world is left wondering whether the movie announcement was simply a joke, secretly in progress this whole time, or canceled. A straightforward answer as to exactly what happened to the Madden Curse movie would be much appreciated. Please respond ASAP, because we have deadlines to meet. While dutifully waiting for Mr. Gervin's reply, we at KoopaTV did some investigative journalism. According to Elizabeth Brett's LinkedIn profile, she worked at EA as the Communications Director from June 2012 to May 2013. Because this is not "present", we conclude that Ms. Brett was terminated. Permanently. This was unfortunately confirmed by EA. This confirmation prompted Ms. Brett's removal from EA's press core listing, and as of when this is published there is no EA SPORTS Madden contact. Me: You mean you murdered her! EA: It was a simple case of distracted NASCAR driving. I shouldn't have been doing my hair. 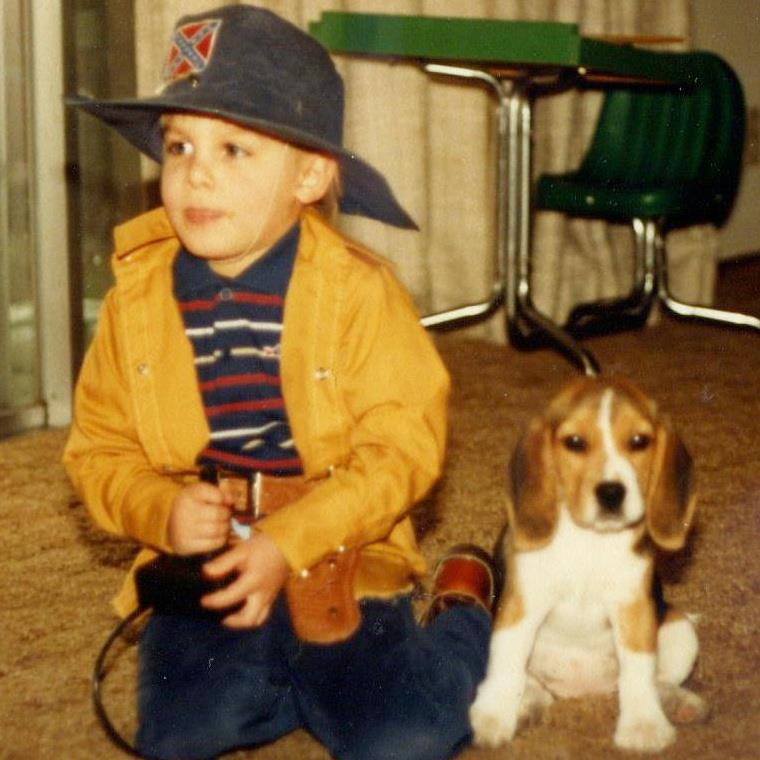 We also discovered that Greg Gervin is a Neo-Confederate just like me. Greg Gervin's Facebook profile picture. 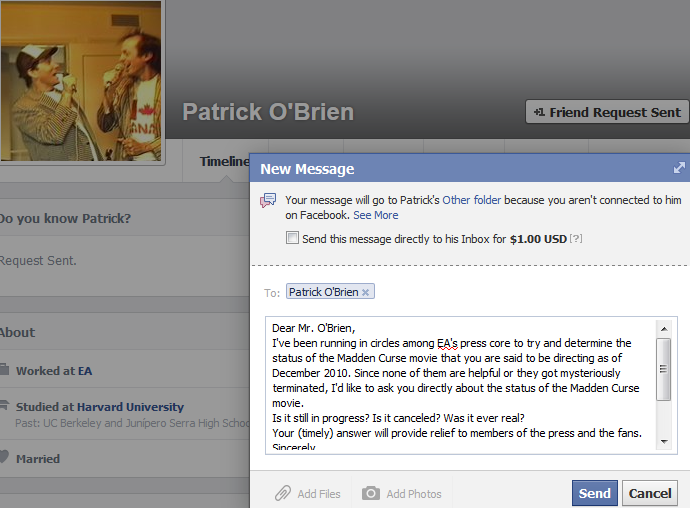 Additionally we uncovered Pat O'Brien's Facebook profile and sent him both a friend request and a message. If anyone knows the status of the movie, it's the director. Of course, EA wants us to give them money just to TALK TO THEM. We have a boycott to maintain! However, they never replied. No one did. No messages were answered, and no friend requests were accepted. At any point. It's June now. EA is actively covering up whatever happened to the Madden Curse movie. They've gone so far as to eliminate Elizabeth Brett over it. Interestingly, back in June 2012 EA announced that DreamWorks Studios would be working on a Need For Speed movie. This seemed to be another case of Madden Curse where EA Entertainment announces something and nothing ever happens. Well, now we know that production on that Need For Speed movie is finally happening. Scenes for the major motion picture "Need for Speed" will be filmed locally this week. You've likely already heard the news, thanks to the recent announcement that the 13th Street bridge will be closed for multiple days in conjunction with the project. Madden Curse, announced back in 2010 has been abandoned in favor of ruining the commerce of a city in Georgia for a movie announced in 2012. KoopaTV will continue relentlessly pursuing EA for not only the termination of Elizabeth Brett, but for the status of the movie, and the fact that EA has the worst customer service and press core we've ever encountered in any company in the United States. We ask that you join our movement and copy/paste this article link to EA through their social media channels. And don't just do it once. Do it multiple times over time. We can't let EA get away with this! EA hates their fans. They hate their non-fans. They hate the press. They hate other members of the industry. They hate their own employees. They hate truth and decency. It is our job as the consumer base to put these bastards in their place. Ludwig is boycotting EA and will continue to do so. Expect to see more articles on KoopaTV about EA. To follow Ludwig's crusade against EA on social media, friend him on Facebook. To see the next article in this series, click here! If you want to read the story of how another game company treats its movies, look at this link! For a direct "update" on the status of the movie, click here! EA keeps changing PR people. Here's the try of the first half of 2014! KoopaTV finally gets an answer from Pat O'Brien himself. The ending of this saga?